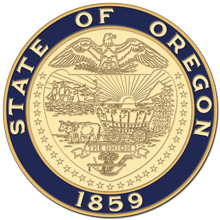 Salem, OR—Governor Kate Brown today signed HB 4145 into law, a bill that she introduced to the legislature. The bill, which received bipartisan support in the legislature, closes the “Intimate Partner Loophole” by preventing convicted stalkers and domestic violence offenders from buying guns and keeping guns. "I'm proud to sign this bill, making Oregon the first state to take action to prevent senseless gun violence since the tragedy in Parkland, Florida," Governor Brown said. "Today marks an important milestone, but we know we have more to do. It's long past time we hold the White House and Congress accountable. Now's the time to enact real change and federal gun safety legislation." Governor Brown was joined by a crowd of some 200 students, gun safety advocates, and survivor families from across Oregon. Prior to signing the bill, Governor Brown met with Oregon students to discuss the importance of continued action to end gun violence, and what steps they would like to see the state take to improve school safety. Photos and video from the student discussion and bill signing are available here.